Hide and Seek is the name of the project for a family with two children in Singapore, completed by architecture firm WY-TO. 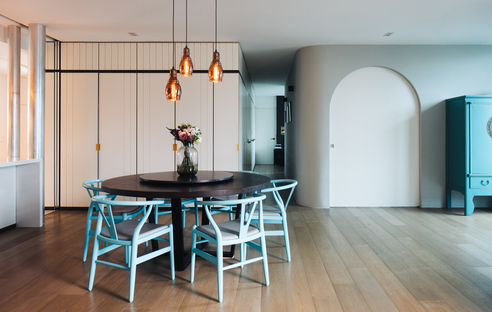 The young architects gave the existing apartment a brand new floor plan, creating rooms tailored for children without neglecting the needs of the adults. A home where children can make memories: to put it in a nutshell, this was the brief for the architects from WY-TO, who work between France and Singapore. 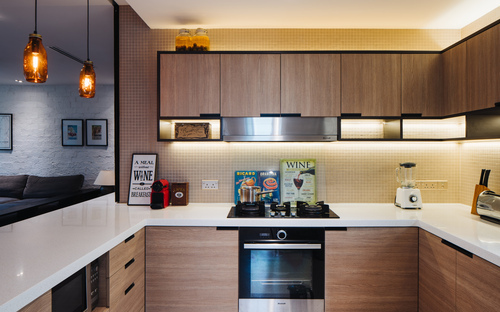 Their clients, the parents of two small children, wanted to adapt their condominium apartment to meet the needs of their children so the whole family could live in a relaxed, cheerful environment without the classic restrictions and divided spaces that make for difficult sharing. The layout of the existing apartment was the standard small living room, separate kitchen, long hallway lined with rooms on both sides and, lastly, the master bedroom at the end of the hallway. To make the most of the space, the walls in the kitchen and a bedroom were knocked down. This made it possible to create a visual connection with the rest of the home, in addition to taking advantage of the delightful views of Singapore's Keppel Bay. When the floor-to-ceiling door of the master's bedroom is open, it creates a corridor effect that allows the occupants to feel the continuity of the space. This forms the main axis of connection for the home so that even while everyone is going about their daily routine, nobody feels disconnected from the rest of the family. When this door is closed, the combined living/dining and kitchen space becomes the primary focus of shared family life. A bi-fold glass door and panels can be closed to keep cooking smells in the kitchen without breaking up the visual continuity. WY-TO didn't fall into the stereotype trap of kitsch-like bright colours for homes with children, instead opting for a restrained and at the same time stimulating style using small touches and expedients that encourage the youngsters to explore their living environment. 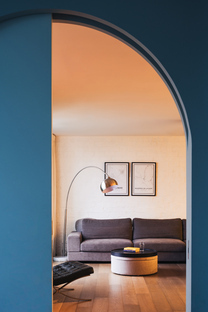 The whole interior design is based on the visual connection of the rooms as well as a storage wall right along the hallway, custom-made by the architects and giving the project its name: hide and seek. 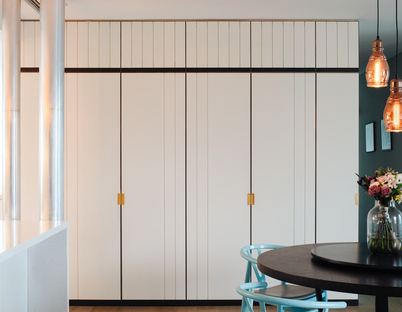 A regular system of vertical and horizontal stripes creates hidden doors and rooms, including the doors to the children's bedroom and bathroom, which are designed almost as if they were secret doors recalling the wardrobe adventures in The Chronicles of Narnia. There's even a secret mini door tucked into the back of the kids' wardrobe leading directly into the master bedroom. An architecturally interesting solution that introduces a sense of novelty and discovery into their enclave. 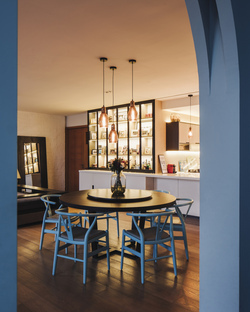 Overall, the home designed by WY-TO has been turned into a flexible space for various uses, from entertaining guests to just enjoying the company of family during a relaxing evening. One thing is certain, the attentive architectural design here means that each and every family member can find a way to live beautiful moments and to create new and stimulating memories.